Few books manage to cast a magic spell from beginning to end. 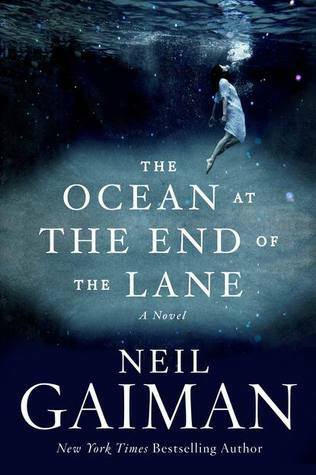 Gaiman managed a feat that as a reader left me spellbound and as a writer, left me in awe. Yeah, I’m late to his fan club party but what an introduction The Ocean at the End of the Lane makes! The protagonist starts at a funeral, wanders aimlessly towards the home of his childhood friend then recounts his youth while sitting and staring into her backyard pond. The friendship fostered with one amazing little girl takes the reader on a journey that delights the heart even in its sadness. It is a modern day fairy tale. Between the pages, one will find fantasy, the power of friendship, life with its inherent darkness and light, the vastly real and beautiful view when seeing the world from a child’s perspective. There are truths here if one dares to peek behind the curtain. Open truths about human nature, spiritual laws and if we choose, the fantastical weave of the unseen world cloaking ours. Perhaps this is what I so enjoyed, being reminded of my own youthful innocence which believed in things my physical eyes did not see but my heart insisted were real. In that regard, I felt the book’s magic. I also felt the beating pulse of breath that carried it from writer’s hand to full-fledged being bound in paper stock. Gaiman brought the Hemstocks to life in a way that makes me thankful and maybe a little misty eyed too, to have brushed up against their world. I’ll not say more except it is a damn good story. One I will circle back to again because there is prose and beauty to his words. Much more than plot and structure, beginning, middle and end. Gaiman captured the story or perhaps it had captured him. Either way, in the Hempstock women, one is invited to another world where oceans really do exist in ponds. For that, I thank him.